Extensive Reading is reading a lot of easy English books that are interesting. Extensive reading can help you gain reading comprehension, reading speed, vocabulary, and writing skills in English. Read for fun. Read books that are interesting to you. You choose what to read. If you do not like a book, stop reading it and choose another one. Read easy books. 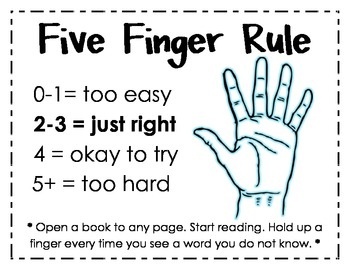 Use the Five Finger Method to find a book at your level. Read different books. Read fiction and nonfiction, biography and graphic novels, adventure and mystery stories. Read many books. Try to read at least one book a week. Do not use a dictionary while reading. Try to guess what a word means from the sentence. Read to understand the story, not every word. Read on your own. Read outside of school. Read at home or in the car. The library's English Language Program collection is located on the third floor, near the reference and media collections. 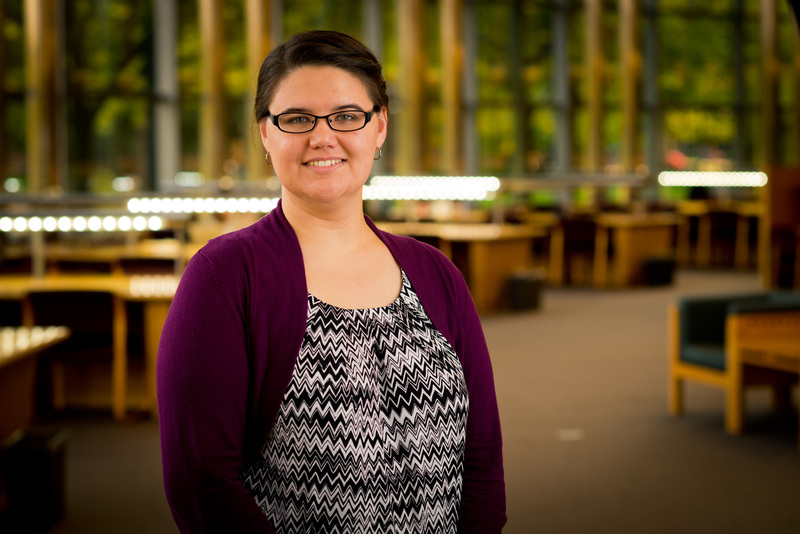 The collection has books at different reading levels specifically for UM - Flint's ELP students. Students can use their M-Card to check out books for one week. Level 1 (G, F, E) books are for students in Reading and Writing 1 and 2 classes. They have a RED DOT on the cover. Level 3 (B, A, X) books are for students in Reading and Writing 5 and 6 classes. They have a BLUE DOT on the cover. The 8 sub-levels are to help find a level of difficulty. G books are the easiest. X books are the hardest. When you are choosing a book from the library, try to find a book that interests you and is at your reading level. To find out if a book is at your reading level look at the level (1, 2, 3) and sub-level (G, F, E, D, C, B, A, X). If you still ar not sure, use the Five Finger Method. To start, count the number of new words you see on the first few pages. No new words or only one new word means that the book is too easy. Two or three new words means that the book is perfect for you. Four new words means that the book is a little hard, but you can try it if the book is interesting. Five or more new words means that the book is too hard and you may not enjoy it. This is called the Five-Finger Rule from the Extensive Reading Foundation. Fiction Books and stories that are not true, but some may be based on facts. A type of book that has a specific format, setting, or plot. Examples are poetry, drama, mystery, science fiction, fantasy, western, and romance. Nonfiction Books and stories that are true; books that contain facts. Biography The true story of a person's life. Mirlyn The online search tool you use to look for our books and some ebooks. A series of letters and numbers given to a book that helps you locate the book on the shelves. The Thompson Library uses a system called the Library of Congress Classification and call numbers are shelved by the alphabet and then by number. Blurb The short description of the book's content found on the back cover or dust jacket of a book. A story told in related cartoon pictures with characters speaking in word balloons. Comics are usually shorter than graphic novels, contain fewer episodes of a story, always have more than one issue, and are often funny. A story told in related cartoon pictures with characters speaking in word balloons. Graphic novels can be collections of comic books, they do not always have more than one issue, and they are often more serious than comics. Read-along A story that you read and listen to at the same time.